Yup, including me. Sooner or later, everybody falls when skating. I’m not that bothered with a little lost skin. I was playing hockey with a bunch of friends and a push from another skater had me over. 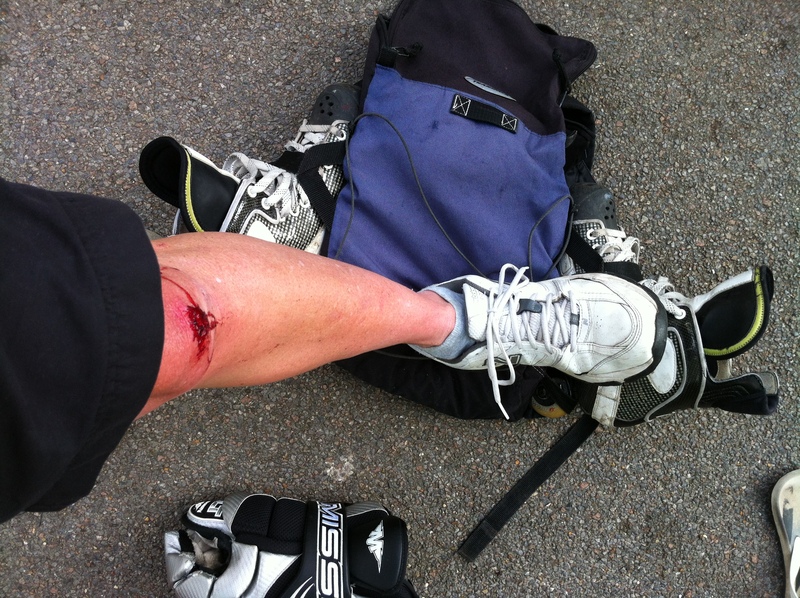 It wasn’t their fault – hockey is a contact sport after all, even relatively gentle pickup hockey in the park. Years of falling over meant that it was nothing more than a gentle roll. Eddy Matzger taught me years ago that the more you roll, the less skin you lose. That was a tip worth its weight in gold, and it meant that here I lost hardly any skin. Perhaps I’m a bad example by not wearing pads? I must admit I’d normally want to wear shin and knee guards when playing hockey, but that’s mostly to avoid the pain of taking a stick to your shins. I’d probably have been scrape free otherwise. Most of my skating friends have at least one pair of jeans with torn knees too. Why should you bend your knees on skates?